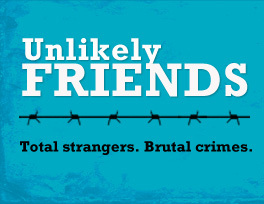 The UNLIKELY FRIENDS team is excited about being a part of the impact of sharing the film in your community. The film’s director, Leslie Neale, as well as the victim/survivors featured in the film are frequently available to attend screening events to help bring awareness to an entirely new level. To host a public screening, you will need licensing permission to show the film. Please read the package options below and fill out the form below for our team to connect for further details, availability, and fees. This includes the licensing of the film for a public event and also includes free DVDs of the film to sell at your event to help recoup the full costs. This package includes the licensing of the film, along with free DVDs, and downloadable materials for promoting and hosting an event – flyers, posters, press releases, etc. This package includes all the elements of the above “Inclusive” package, and if your event venue allows either the filmmaker and/or those featured in the film can be available for discussion after the screening via Skype. This is the greatest way to make an impact! Leslie Neale, the director of the film, along with those featured in the film can at your event in person to bring elements of the film to life. The licensing fee for showing the film will be waived and we ask for a small speaker’s fee that can work within your budget.